The "Gay Nineties" had a totally different meaning then. Here in Sharon Meadow at Childrens Playground, one could rent a pair of roller skates and skate the day away. San Francisco's Golden Gate Park is one of the City's most treasured resources. It 1017 acres of beautiful green oasis that is surrounded by an ever-growing urban metropolis. The park has a very rich, well documented history going back to the 1800s. It has served as green retreat where one couldescape the pressures of city life. Even then, people looking for ways to escape could experience the sensation of rolling along with wheels on their feet. about skating in Golden Gate Park as they are today. The San Francisco Recreation and Parks Dept. built a roller rink in the park where people could rent skates. It was considered the elagant, even chic thing to do. In 1894, the Midwinter International Exposition was held in the park, giving us what is now the Japanese Tea Garden and the M.H. de Young Museum. In 1906, the earthquake and fire turned the park into a temporary haven for approximately 200,000 people left homeless by the disaster. By 1967, as the hippies were flocking to the Haight Ashbury in the Summer of Love, John F. Kennedy Drive, the main road in Golden Gate Park, was closed to all car traffic on Sundays. It was the closing of this road to traffic would one day lead to the biggest explosion of skating anyone could ever imagine. Skating didn't see really big numbers rolling in the park until about 1978. This is when the first skate vendor trucks began to line up along Fulton St. 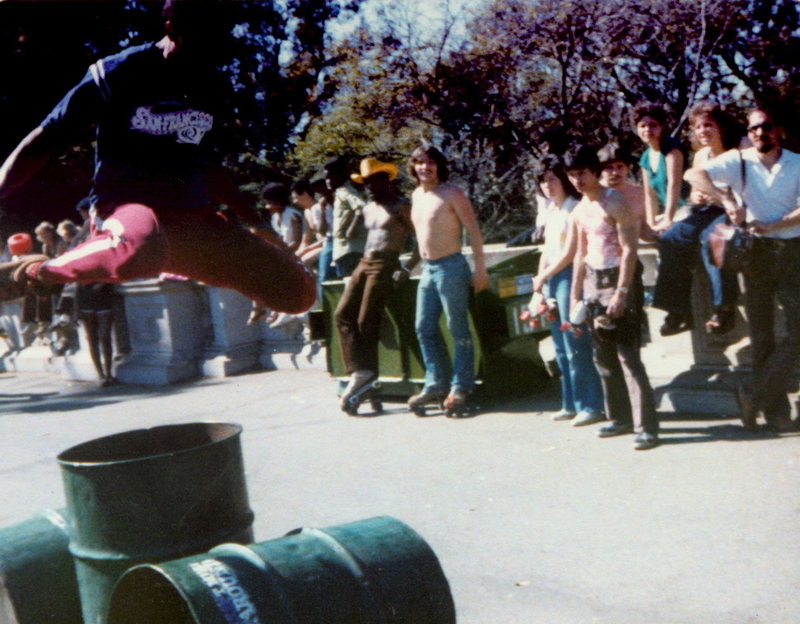 The summer of 1979 saw estimates of 15,000 to 20,000 skaters using Golden Gate Park on Sundays. There were over 35 skate vendor trucks that rented skates alongside the park border, each truck containing between 200 and 500 pairs of skates. The free enterprise system was in full force. Skate rental trucks would park along the border of the park every Sunday. Soon there were complaints. People who lived in the neighborhood complained of skaters doing everything from parking in their driveways to urinating on their premises. The numbers of injuries became a serious strain on the San Francisco Ambulance Service. The question of what to do about the skaters was soon before the Recreation and Parks Commission. The media called it "The Great Skate Debate". The sentiment to ban skating in Golden Gate Park was very strong. After months of public discussion and meetings, the Recreation and Parks Department designated four (4) areas in the park where skating would be prohibited. The Conservatory of Flowers, the Music Concourse, Stow Lake and Children's Playground are known worldwide and are very busy with pedestrian traffic every day. If skaters could not be kept out of these areas, the Recreation and Parks Commission would recommend a total skate ban in the park. Peter Ashe, Assistant Recreation and Parks Superintendent presented the idea of forming a "skate patrol" that would keep skaters out of the restricted areas. Each skate vendor truck provided two (2) skaters to volunteer for "roller patrol" duty. A total of sixty (60) skaters were gathered and made up the first skate patrol. 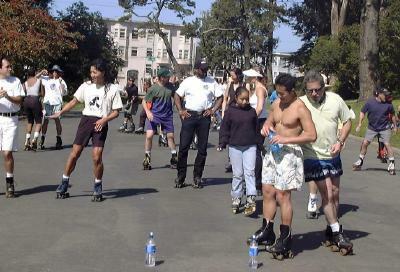 Eventually, the city passed an ordinance banning all "recreational equipment vendors" (skate trucks) from operating in San Francisco, but the skaters stayed together and became the Golden Gate Park Skate Patrol. James Johnson was and STILL IS high jump champion of Golden Gate Park. His record stands at 4ft. 8in. without a ramp. 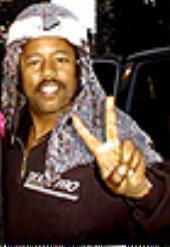 In the late 1970's and into the 1980's roller disco was king. The skaters would gather in the park on the bridge between 8th and 10th Ave. on JFK Drive. The area was smooth and formed a natural outdoor roller rink. Every skaters that could boast even the weakest of moves would be there every Sunday. If you didn't like to skate in one spot, there was "Dr. Funk". He would lead what was called "The Blood Clot" This was a group of skaters (mostly African American) who would skate up and down JFK Drive dancing to the beat from Dr. Funk's gigantic boom box. This was an era of magic, but it could not last forever. By the mid 80's the numbers of skaters began to drop. Skateboarding and BMX bikes began to rise and outnumber the skaters. We were now all sharing the same space on the bridge with other every form of wheeled contraption known to man. The skaters had to find a space of their own. In 1985, David Miles, the Skate Patrol Coordinator, worked with the Park Planner Deborah Learner to permanently close off 6th Ave and Kennedy Drive. The idea was to create a permanent place for skating in Golden Gate Park that could be used every day anytime. At the time the area was being used by only a few skaters who didn't like the big crowds. The closure began as a 30 day trial closure. That was extended to 60 days and then 90 days. Finally, the area was relandscaped and repaved with smooth asphalt to make it look and feel more like an outdoor roller rink. In the next few years it would become the center of roller skating in Northern California. Lateef and Clair were the first skaters to use 6th Ave. for skating on a regular basis. If you have a pair of skates and are ready to boogie, THIS is the place to be on a Sunday afternoon. Although roller skating did experience a dramatic drop in numbers nationwide, you could always find roller skaters at 6th Ave. or "Skatin' Place" as some have called it. By 1988 Rollerblades hit the scene. A lot of roller skaters rediscovered the sport through inlines. Skate moves that were strictly for roller skates were now being done on inline skates. The numbers at 6th Ave. began to grow and grow. 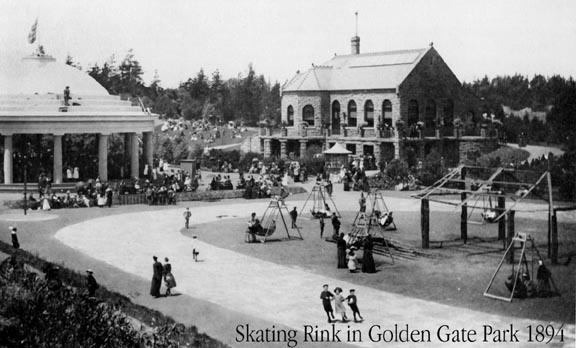 History was repeating itself in 1991 exactly 100 years since John McLaren built the first roller rink in Golden Gate Park as thousands began flocking to park again to skate, dance and groove to the music. The skate area at 6th Ave. and Kennedy Drive is the center of activity for recreational park users on a Sunday Afternoon. Here we are presenting the Red Bull Great Skate Freestyle Roller Dance Championships. Most people coming out to skate these days don't realize the history behind the skating they are so lucky to be able to enjoy. There isn't enough time for me to tell the whole story. In 2003 the skate area was transformed again making it bigger, wider and smoother than ever before. It will serves as an example to every city who wants to bring this fun, exciting and healthy experience to their area. Venice Beach has one. New YORK City has on as well. Hopefully it is only a matter of time until every city has on. San Francisco's "GodFather of Skating"
If you're looking for some fantastic pictures of the skate events we have presented over the years, please take a look at SFPix. This site belongs to Chris Duderstadt who has been a skate advocate for many years and is a great photographer.